Ever gone on vacation and have been inspired enough to stay and start a non-profit? That is exactly what Samir Lakhani did. I’m so impressed with Samir as a human being. He saw children without soap, in risk of disease, and got the idea to ask hotels to give him their used soap, instead of throwing it away. Not only did he figure out how to get these establishments to hand over their used soap, he figured out how to recycle that soap, and he now employs almost 150 women at Eco-Soap. Think about how many different ways this little gem of an idea is now helping communities, families. The ripple effects of his impact is astonishingly impressive to me. It’s no wonder he was a CNN Hero. Samir has definitely taken after his mother, Dilshad Lakhani, The Giving Dentist, who I wrote about a couple of months ago. What a great lead to follow. Take a read and #beinspired. So, what made you decide to go out on your own start your own non-profit? About four years ago, I saw something devastating—and I just had to act. While volunteering in Northern Cambodia, I witnessed a scene in a village which still haunts me to this day: a village woman bathing her newborn son, scrubbing his skin with laundry powder. I wanted to help, to do something. Anything. But, I didn’t know how to help in a lasting, meaningful way. I felt completely powerless. But then, something incredible happened. I returned to my hotel room, stepped into my bathroom and noticed that my housekeeper had thrown away a bar of soap that I had barely touched. It was in that moment I knew what I could do. 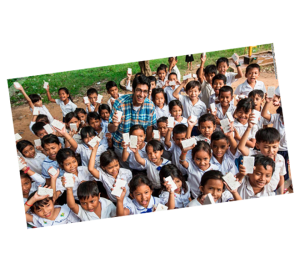 That’s the story of Eco-Soap Bank and to date we’ve been able to provide soap and education to over 720,000 people in 10 countries—all because of a single experience and a solution waiting to be activated. After seeing the hotel room soap in the trash, what were some of the first initial steps you took in making your idea a reality? How did you even know where to start? Like many, the path is not immediately clear. (For me, it was even quite comedic!) I was so excited about the prospect of saving soap that the very next morning after realizing the idea, I went on a bicycle in the 100+ degree heat to meet with general managers of hotels in suits. Sweaty and tired, I asked for their used soap. They look puzzled, but as they began to realize that this initiative could save lives they joined in a heartbeat. You need tough skin to do something new, to innovate, and to go where others haven’t. Initially when I came up with the idea of “recycling soap” – many people and groups scoffed at me. They said it would never work or that hotels would never join. Personally, I had to continue the momentum and push through the skepticism. But, over time, our partnerships began to grow. With partners, such as Diversey, this year we’ll reach 1 million people. Positivity. Stay unwaveringly positive. As Michelle Obama says: when they go low, we go high. Optimism creates solutions, breaks barriers, and overcomes all. However, in order to grow, learn to invite constructive criticism. Give and take criticism cheerfully. Not sure – but I’ll never look at an omelet the same way again. To rebuild. I see so much devastation in the Middle East and all I want to do is help rebuild demolished homes so people can return to their countries, their lives, and their families. Lean in. I would have asked for more support and not felt the least bit shy about it. 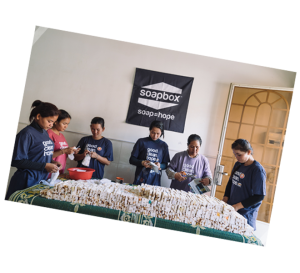 Eco-Soap Bank does important work and I would have been more forthright in asking people to get involved and to make a difference in the lives of people around the world. So, if you’ve found something worth fighting and advocating for, don’t equivocate. My parents. They have come from East Africa to a life of prosperity and philanthropy. They are my single biggest inspiration in life. The women we employ. Never before have they been given the platform to transform communities, to affect lasting change, and to improve health. They are champions and I’m so proud to have played a small part in employing nearly 150 women and providing them with free education. 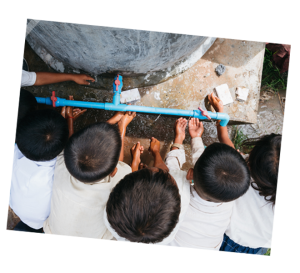 They provide the energy and goodwill Eco-Soap Bank contributes to communities around the world. If you could have dinner with anyone in the world, who would you pick and why? Malala Yousafzai – because I wish to learn from her how she turned pain into hope. She is one of the most important voices of our generation and to carry her message forward would be the honor of a lifetime. Looking back, would you take this journey to form Eco-Soap all over again? Yes, absolutely. It’s a privilege to know that your efforts directly help people. That is a satisfaction which is unrivaled and no amount of money could convince me to do otherwise. An existential question. If you could come back and redo life over again, without having any of the lessons you’ve learned this go around in your arsenal, would you? Absolutely. Discovery is a beautiful thing. Travel is an outstanding way to stretch your perspective and mind. Meeting new people is the stuff of life. Sharing our humanity makes this life worthwhile. This entry was posted on November 18, 2018 by dvblogAdmin.